Gluten Free Beat ®: Five Guys Fries, Oh My! 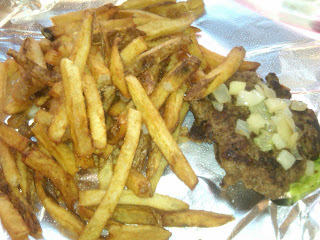 Five Guys Burgers and Fries is a fast food joint serving.. you guessed it, burgers and fries. 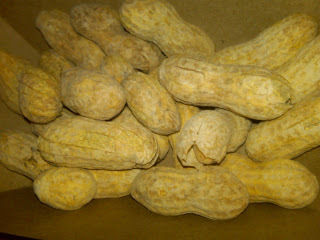 It was reminiscent of Roadhouse Grill to me, as they have bulk peanuts you can grab and eat. It's a very chill restaurant, fast food like as you order at the window, but, a step up in quality from typical fast food joints (and a small step up in price as well). The peanuts are free, which is a very nice touch! The portion size value for your money is REALLY nice. The fries are ridiculous, they are fresh (they have about 6 fryers going at once, with JUST fries) are fried in peanut oil and are overflowing. I love the skin that's left on the potatoes. The fries are actually rich, they're decedent, even me, a french fry lover, couldn't finish the huge stack of fries in my small order. The hamburger was the regular burger, I'd really consider a small next time, the regular has 2 pieces of meat, which for me was one too many. What I liked a lot is ALL toppings are FREE! I added onions and lettuce, and obviously did without the bun (which contains egg, dairy, gluten and soy). 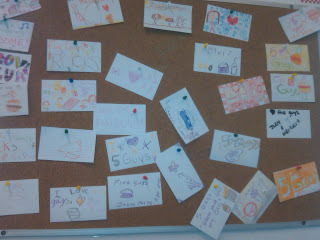 It was very cute to see a wall of Five Guys love - where all could praise what they loved about Five Guys. All in all, it is great to have another fast food option, especially one with fries us gluten free folk can enjoy! If you care to meet the guys behind Five Guys founder, read Inc. Magazine's tell all to the left! Five Guys Cypress Creek Station in Ft. Lauderdale is fabulous. The manager took care of my order personally and made sure that cross-contamination would not be an issue. Employees there are great. I even e-mailed corporate to compliment them!